Emeryville, CA, March 8, 2018 — On February 14, 2018, the Sapphire Awards Gala Dinner celebrated the most innovative companies in the solid-state lighting (SSL) industry by naming the fourth annual LED Magazine Sapphire Award winners. The event, held in Long Beach, CA aboard the RMS Queen Mary, recognized the most innovative LED-centric technologies across the lighting industry. 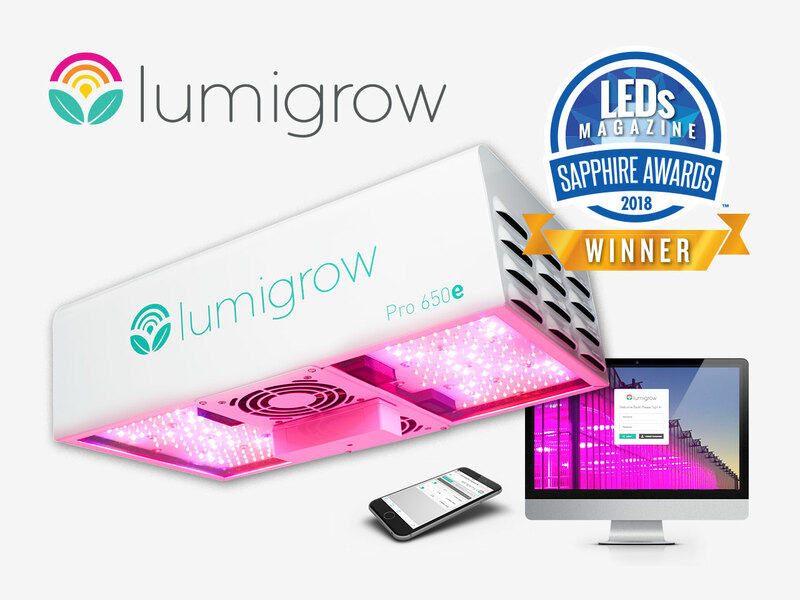 LumiGrow was delighted to receive a Sapphire Award for Best Horticultural Lighting Solution of the year. The LumiGrow Smart Lighting Solution lead the pack for data-centric innovations fundamentally changing the industry. The smart horticultural lighting solution begins with LED fixtures that are dynamically adjustable for light intensity, spectrum, and photoperiod. 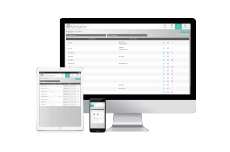 The fixtures are then integrated with Wi-Fi modules used to control the fixtures by zone from any smartphone, tablet, or computer. This level of dynamic control is used to deploy advanced horticultural lighting strategies built to improve crop quality, achieve higher crop yields (in some cases up to 40% without any additional energy-usage required), and elicit desired crop characteristics by customizing plant morphology, color, flavor, and nutrition. The next level of the solution comes when plugging LumiGrow Light Sensor Modules into the fixtures. The light sensors analyze sunlight within the greenhouse and report data back to the Wireless Control System. The LumiGrow system will then learn cloud-cover and lighting patterns to adjust the LumiGrow fixtures and automatically deliver ideal lighting conditions year-round. Growers can then access the LumiGrow software interface to gain better understanding of their lighting performance. seasonal sunlight conditions, and power-usage by monitoring daily and historical lighting charts to track both sunlight and supplemental LED light levels at the crop. “The agricultural industry is now seeing the value that advanced data-centric technologies can have when meeting rapidly increasing demands for a growing world population. For the last ten years we’ve been deploying smart horticultural lighting solutions, advancing a new field of science to create value where it wasn’t possible before. We already have over 8,000 smart fixtures in the cloud. Now we’re just making our solution as automated and easy-to-use as possible to support growers worldwide.” says LumiGrow CEO, Shami Patel. A panel of 27 independent judges chose the LumiGrow Smart Horticultural Lighting Solution from a group of numerous finalists, which included the category’s 2017 incumbent. The judges are chosen from industry and consultancy roles to ensure that each entry is fairly evaluated by multiple experts. All judges were carefully screened to verify that there were no possible conflicts of interest in the process and ensure that the best and most innovative solutions were recognized.